So today is the last day. It's been a really awesome experience. This 5 day challenge really opened my eyes to how much I enjoy drawing on a daily basis. So it will become a daily thing from now on. But for those of you who miss the old how-to posts, don't worry they're coming back. The funny thing is readership has gone up during these 5 days. Anyway, this is Harley Quinn. This is one of my favorite characters of fiction from Batman's rogues gallery. 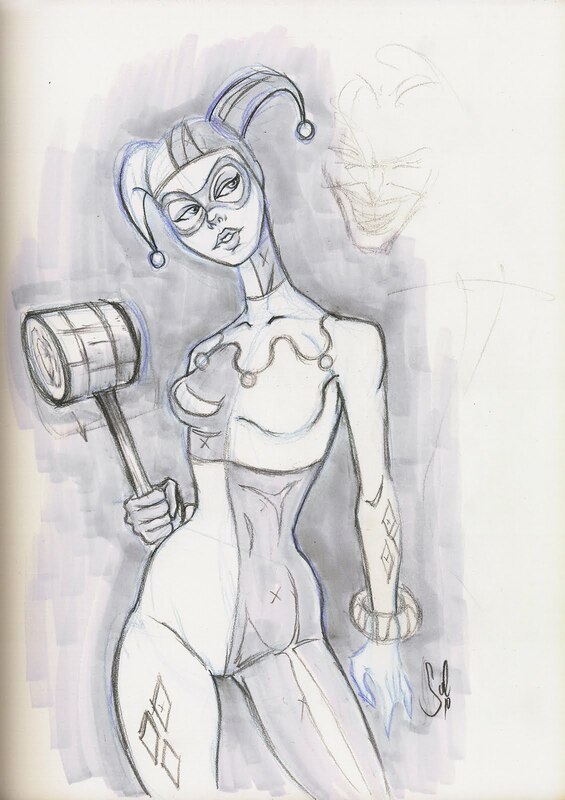 She's the Joker's hench-girl who started off as a throw-away character on the Batman: Animated Series who became a mainstay. She became a part of the Batman comic continuity soon after and has become a favorite among fans. The reason why she's so interesting is that she wasn't just some girl off the street that was found by the Joker. She didn't have a background of abuse or drugs. No. Harleen Quinzel was actually Dr. Harleen Quinzel before she began treating the Joker and slowly had her mind snapped by him. We hear about this kind of thing in the news, but no one is as loveable as Harley. Unfortunately, she's like the pretty cheerleader dating the jerk quarterback. The Joker cares nothing for her, but she stays committed regardless. I'm going to do something really cool with this sketch, so stay tuned for that. Thanks for the support and for sharing these posts with your friends. I hope you enjoyed the ride and keep coming back. Thanks! P.S. I forgot to mention that what influenced this sketch was seeing the movie Black Swan, starring Natalie Portman and the old Aeon Flux animated shorts. Awesome. I can already see where your going with this. I love her expression. Found found you on DA. I love your harley and can't wait to see the final version. Nice blog. I didn't know this character so thanls for the background. Is she carrying the mallet to get him to be more committed? Your drawings are getting better and better with your 5 day challenge - it does work that way doesn't it? Perhaps I'll have to try one in January! I love Harely. She's great! And her story's great too.